The Plot Beneath the Garden – who speaks and acts? This chapter will discuss the framework, projects, and reflections of my undergraduate winter seminar on Detroit’s Community Gardens entitled, “The Plot Beneath the Garden.” In this course, my students and I partnered with the Oakland Avenue Urban Farm in Detroit’s North End to study the participatory practices of land stewardship, food production, and community development. Specifically, we engaged with our partners’ stories—distinct in race, class, and gender—and placed them in conversation with a range of theoretical and historical perspectives on space, politics, and justice. As we explored these accounts, we discussed how our partners are imagining the city for themselves and their communities, and the extent to which they are building an infrastructure to support those visions through agriculture, art, and architecture. 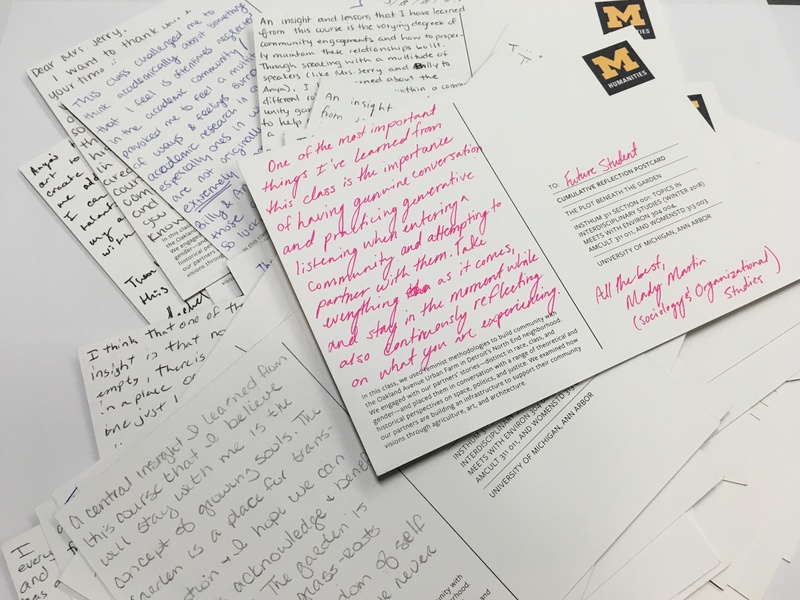 At its core, the course served as a space of reflection for students, and opportunity for us to collaboratively and critically inform the Smithsonian’s “Community of Gardens” digital public archive. 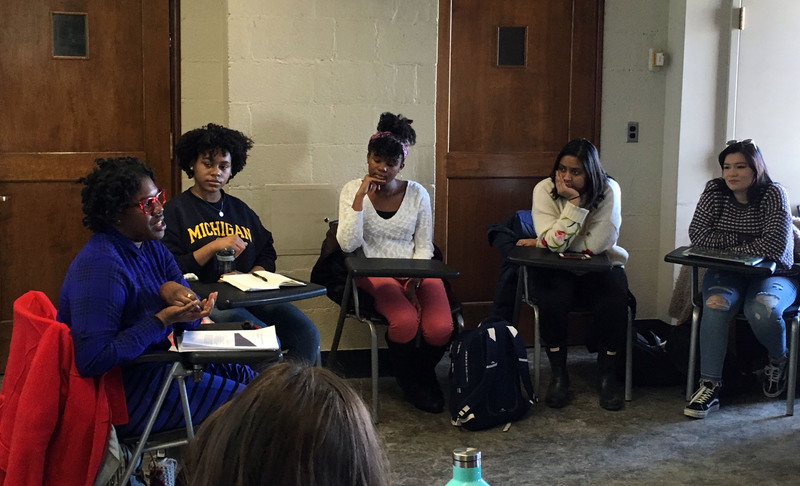 Using feminist frameworks and methodologies, we grappled with disparities in power and privilege, not just between genders, but also between non-academic and academic groups. Our goal was to understand inequalities built into engaged practices, to unpack institutional and community biographies, and to learn with knowledges drawn from and connected to everyday life. 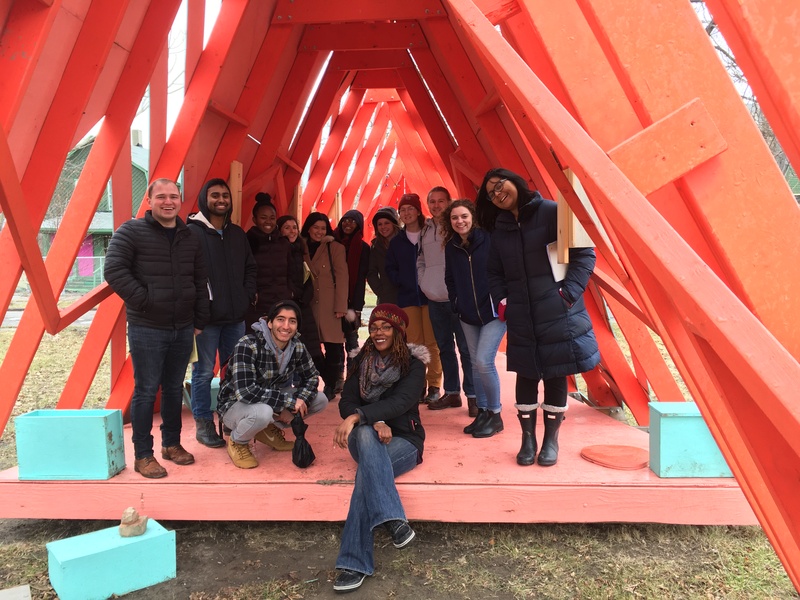 To sustain connection, we built upon the existing relationship between the Oakland Avenue Urban Farm and Akoaki, a Detroit-based design practice founded by Jean Louis Farges and U-M Architecture Professor Anya Sirota. The class participants included community partners to foster an environment of mutual benefit, lay bare our respective stakes in this project, and modify components based on emerging concerns.